The law of averages suggests that sooner or later we’ll have a break from the wet weather that started in July. It hasn’t happened yet! 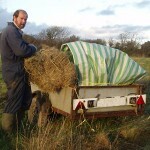 A helpful neighbouring organic farmer engaged a contractor to clear one field of silage bales; he bought about 30 of them. 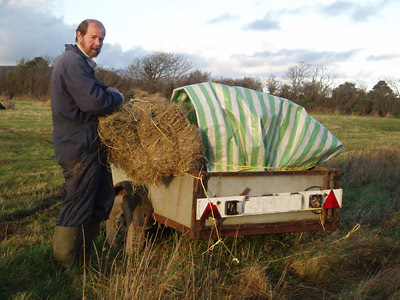 This was our quota to sell, as organic standards set a limit on the proportion of conserved forage, and hence fertility, which can be exported from the farm. 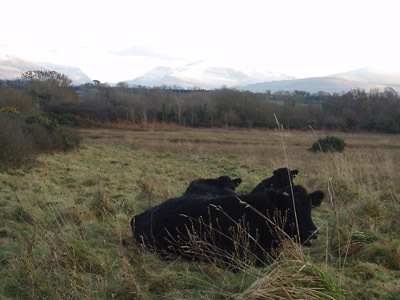 We took Gwen and the 3 young calves – Lili, Lois and Ogwen – down to the bottom field at Ty’n Coed. There they can find shelter and graze down some of the overgrown vegetation. We visit them every day and take them half a bale of home-grown hay. This move coincided with the arrival of Luke at Tyddyn Adda. 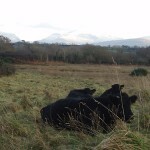 He is a huge Welsh Black bull who is having a third winter vacation here with the cows. The other event of the month was foot-trimming for cattle. It’s an occasional, but necessary ordeal for the cows. This time the job was made so much easier by a wonderful crate that rolled them onto their sides so that their feet were presented at easy-to-clip height. Our small flock of sheep has bonded well with Bingo, the new ram. We brought them in to trim their feet, and gave them a change of field, but cheap viagra pills otherwise this has been a quiet month for them. So things are all ship-shape for December! This entry was posted on Sunday, November 30th, 2008 at 6:20 pm and is filed under Diary. You can follow any responses to this entry through the RSS 2.0 feed. Both comments and pings are currently closed.